Post-Script: Here's a Wikipedia article about the amateur telescope revolution that John Dobson started. As I alluded to in this piece, a big "light-bucket" of a telescope doesn't necessarily help you see better in poor skies such as found in cities. That's why many urban stargazers use smaller scopes like high-quality refractors, or smaller-sized mirror telescopes with longer focal ratios, better suited for observing the moon and planets - objects that are still well-suited for urban viewing (along with open star clusters, globular clusters and variable stars). For myself, the ease of setup and storage is of prime concern, hence my preference for binoculars and a tripod; or, as seen in the top photo, my observing mount for using the large binoculars with a reclining lawn chair. As for the 8" reflector scope mentioned, it's been in storage for a few years; a gift from a relative, but one that I've been ill-suited to use, due to the German equatorial mount's ungainly size when assembled, and difficulty of storing otherwise. Hence my idea of converting this scope to a Dobsonian-style mount, which would require only several square feet of floor space to store, in an upright position, when not being used. Of course, the downside of such a mounting system is that the scope is no longer clock-driven to follow the motion of the stars, but it seems like a reasonable compromise to gain more viewing opportunities through the larger instrument. One other experience from early this morning that I'd like to mention is, while viewing the Great Nebula in Orion, an artificial satellite zipped through my field of view, right past Orion's belt, heading northeast. I was able to easily follow it with my naked eye, even with the sky glow from city lights and dawn in the east, until it was below my local horizon. This in itself was not so unusual, but it was the brightness of the satellite that amazed me, as bright as the brightest star in the sky, that being Sirius, to the southeast of Orion; and no, I don't believe it was the International Space Station. I'm guessing military; someone's military, anyway. I then turned back to the telescope and Orion, when yet another, dimmer satellite zips right past again, following the same orbit as the earlier object, as if the two were orbiting in close proximity. This second one was more reddish-orange in color and couldn't be seen with the naked eye. As a visual observer of the night sky, and in the tradition of countless others who have observed the mysteries of the night sky for thousands of years in various cultures, we're going to have to get used to the idea that artificial satellites are part of the visual sky-watching experience, every bit of a viable visual phenomenon as any other observable event. I mention this because the subject is virtually taboo on astronomy discussion forums these days, who relegate the mention of such objects as "oh, another satellite," or "oh, just an abandoned rocket booster tumbling in orbit," or "oh, just another Iridium flare;" as if it were appropriate to classify man-made satellites differently from natural, then dismiss them altogether. To the visual observer, they are one and the same: visual phenomena that I go outside and can see , often both in the same field of view. Yes, they may have different origins, but many of them will be in orbit for centuries, new celestial objects to be seen from the ground. There's also a rather unscientific lack of curiosity about the nature and purpose of such artificial satellites, at least in the amateur community, out of proportion to the curiosity they'd otherwise show for natural celestial objects. Like there's some mental gymnastics at work, some denial that comes from living under the watchful eye of ... whomever. But this little stargazing experience reinforced the notion that curiosity is at the core of all scientific inquiry, and is essential to what makes us uniquely human. Don't ever lose your curiosity, even if it's about something "they" say shouldn't be thought about or discussed; probably a good sign you're on to something important. (1) Link to "Living Structures" online PDF. Dwell Design Leaders: Ken Isaacs from Gowanus Sound Initiative on Vimeo. 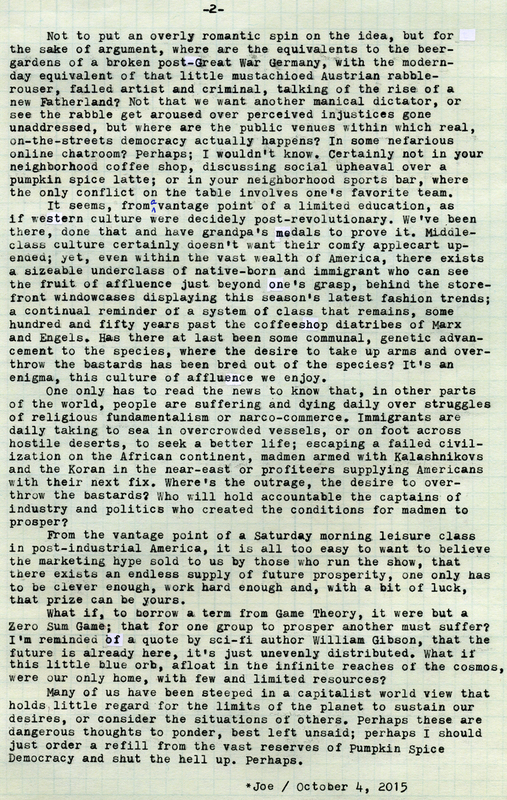 Post-Script: If you take a look at the online PDF of the book at the link provided above (and now in the public domain), take note of the way Isaacs structures his writings, in terms of paragraph formatting. I like that he has provided a bolded, underlined header for each paragraph, that functions as a summary of the content to follow; as if the content of his writings was also structured in a modular fashion similar to his architecture. The body of each paragraph is quaintly lacking capitals, in that funky, 1960s poetic style. 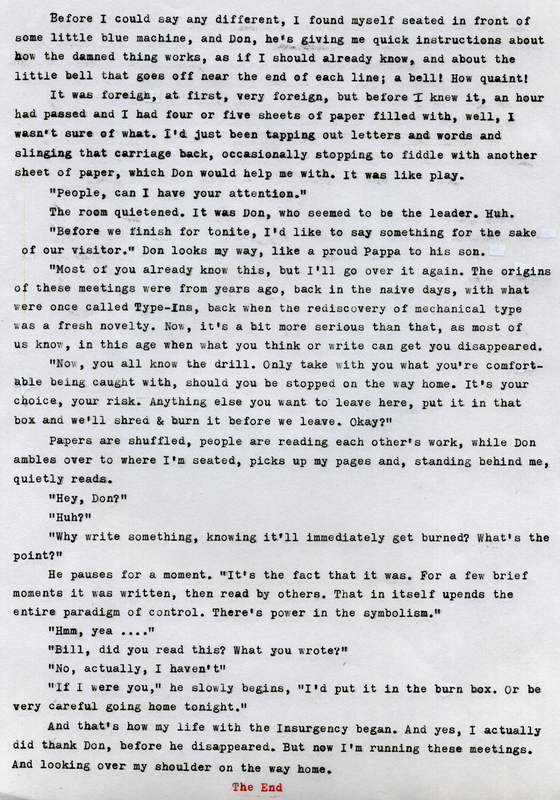 Also, the style of the book's font seems to be very similar to typewritten. Speaking of which, if you click over to pages 28 & 29, note the typewriter in his indoor living structure, which appears to be a Hermes Rocket or Baby. Though Living Structures gave a wealth of practical advice to the would-be constructor, it retained its experimental nature; which I find unique and fascinating. One can but wonder what advances could be made to the concept given today's on-demand, 3D-printing technology. After rereading the book last night, I was immediately reminded of the experimental architecture movement that today reuses metal shipping containers as building-blocks for functional structures, a consequence of the nature of global manufacturing and shipping, where used shipping containers cost more to ship back to Asia than the material is worth. 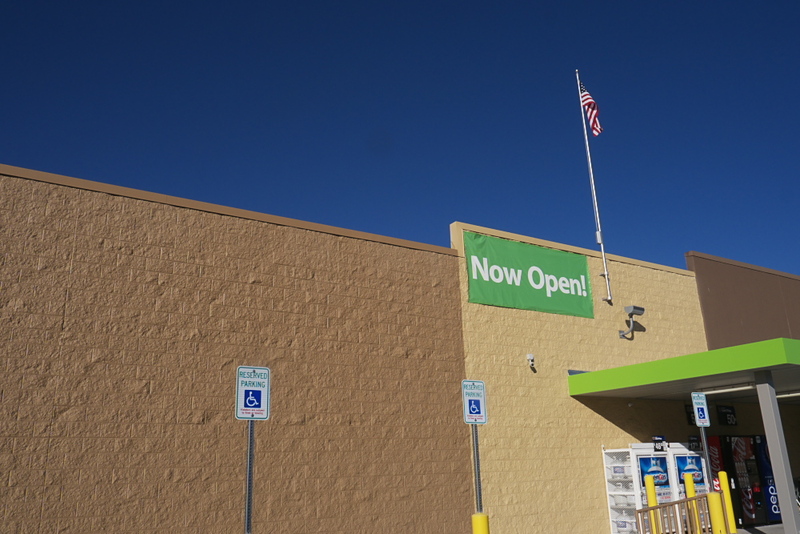 There is one such retail site being developed with the use of such shipping containers, here in Albuquerque. There's a decided idealism to these high-concept notions of Living Structures, inflatable buildings or geodesic domes, that seems to ignore practical realities and their intrinsic drawbacks; realities that I, as a young man, purposefully ignored. One such problem is building a nonstandard-design dwelling in a tract-home subdivision in the midst of suburbia, given the realities of building codes that are often "gamed" by officials and lobbyists from the construction industries to conform to certain expectations of normalcy; or what will the neighbors say with my stack of metal boxes? Alas, Isaacs was only able to dabble with his larger Living Structures because he had inherited a bit of land in rural Illinois, which gets back to that old bit about land ownership affording a person a certain quantity of freedom; which begs the question of how can these concepts be successfully implemented in the context of urban, condensed environments? Top photo via Lumix G5, in the Man Cave shed. Typecast via Olivetti Lettera 22. 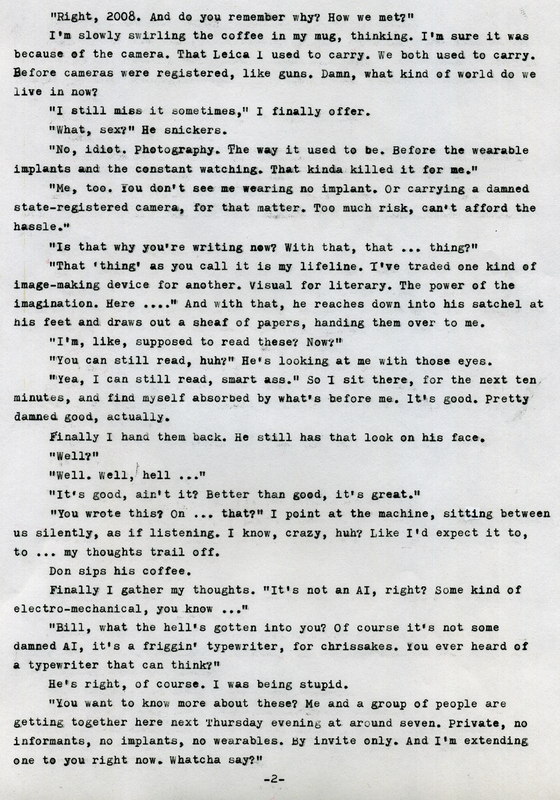 First paragraph, 4th line should read "there were very valid reasons..."
Sixth paragraph, 5th line should read "ultimately..."
Post-Script: I was pleased to have seen the OzTypewriter Blog subsequently get a reprieve from its demise. But the principle stands, nonetheless: blogging is a social activity, which implies it is incumbent upon the reader to participate in a dialog with the writer. It is no wonder that blogging, as a social force, has largely been supplanted with other forms of social media, where the feedback and dialog cycle occurs much more real-time. People are lonely, and are looking for connections with others like-minded as themselves. It takes a peculiar personality to stick with blogging, in this day and age. Yet I do so, perhaps because I'm long-winded and want my piece to be heard in its fullest, not truncated to 140-character snippets. 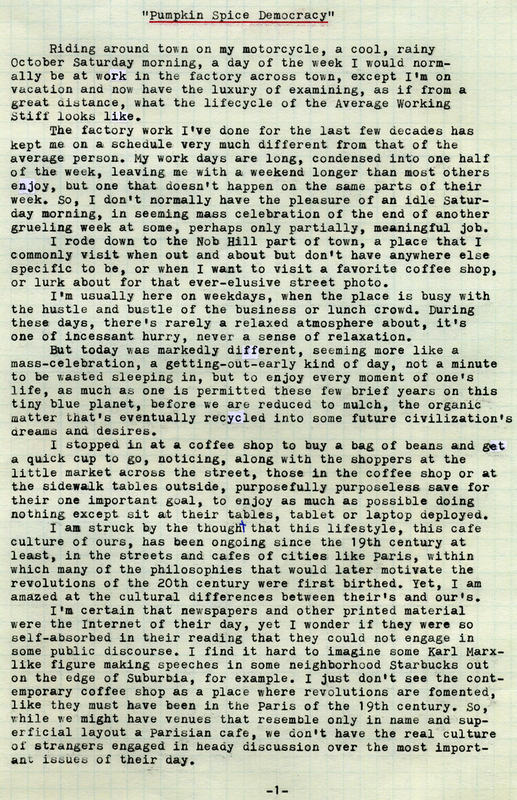 There's also the point that blogs are well structured as archives of useful information (such as Mr. Messenger's), while more expedient forms of social media are more conversational but less relevant long-term, unless one's forte were social historian. In an effort to put my money where my mouth is, I've consciously been trying to comment as many blogs as I can, even if it's with nothing more profound than "Good Job" or "Thank You." Photo via Lumix G5, on the banks of Rio Grande, north of Albuquerque and not at the ocean, alas. No messages for me will be forthcoming, unless it is from upriver, in the high country of Colorado. Typecast via Olivetti Lettera 22. Which reminds me, I recently received a shipment of an online order, sent to my local Staples store, of ten 100-count packs of Mead typing paper, which works out to around 3 cents per sheet. It's very much the "real deal," compared to some old Mead typing paper, from the legacy era of typewriting, that I found at a local thrift store; even the product code number is almost identical, off by a mere one digit. While the old paper was called "Typing Paper," the new is called "Multipurpose Paper." Comparing the two, it's very much the same paper, as far as I can tell. I've begun using this paper almost exclusively. Post-Script: I had been collecting these observations all during our three-week long road trip, using the Notes app on the iPad. I also have a list of more potential subject matter for future blog articles, related to travel. Photo via Fujifilm X10, from somewhere in Montana; typecast via Olivetti Lettera 22. Post-Script: A lot of hay has been made in the business world around customer satisfaction. Every day, it seems, new and inventive ways are concocted of convincing you and I to become someone's customer. Even more important are return customers, since the market for new customers - like those who've never heard of the Yellow M - is much more limited. And so job one, to borrow a marketing phrase from an American automaker, is to get you to come back. So, in that context, it doesn't matter why you come back, right? So long as you do come back. Hence my theory about customer dissatisfaction as a business model. Because the worse thing for a business, more terrible than unhappy customers, is apathy. And unhappy customers at least care, more so than apathetic customers. Photo via Lumix G5 and Brother label maker. Heck, I should've used my Brother typewriter for this piece, but I didn't; instead I used the Olivetti Lettera 22. Post-Script: I can certainly understand the value of secondary school as preparation for college and to gain essential life skills. Still, even when I was in school so many decades ago, there was an emphasis on jobs training, whether that be through Industrial Arts or, in the case of the Math Department back then, teaching kids how to operate cash registers(!). I personally never enjoyed a classic liberal arts education, which seems so foreign these days in America, but am personally familiar with a family of kids who did gain such experience, through being home-schooled; they have subsequently excelled as adults, being emotionally well-balanced and mature beyond their years, in comparison with their peers. My experience of being tutored under Rob Mangold was so rich because he let us explore our ideas. Partway through my second year of Architectural Drafting I experienced an explosion of interest in air-supported structures. Instead of telling me to just drop it, he permitted me to build several prototype inflated structures in the back of our class, along with drawing the blueprints as everyone else had to. The result was not only a design for a private residence using air-inflated tubes as structural members in the walls and roof (the drawings of which are in the top photograph, under the drafting instruments I used), but also an inflatable dome large enough to accommodate several people. I'm certain, looking back upon the experience as an adult, there were some hard feelings on the part of other students in the class, who thought that perhaps I was the teacher's pet. Maybe. But perhaps Mr. Mangold took an interest in this geeky kid because he saw something in me that I couldn't at the time perceive; but which, in the passing of the decades since, has served me well. Perhaps S.T.E.M. - based curricula are the way forward for our society; or perhaps we need a renewed focus upon classical liberal arts education; or perhaps we need to cut everything else out except Common Core Curricula. Whichever way, what's most important is that we retain and reward talented teachers with the heart to see the latent potential in kids like myself, and enable those teachers to go the extra mile to ensure the creative potential of their students is satisfied. Such talent is the heart and soul of effective education, and can't be programmed into existence through Power Point foils and the latest fad in educational theory. I'm living proof. Top photo via Lumix G5, typecast via Olivetti Lettera 22. Post-Script: Is it just me, or does it seem like whatever becomes the latest and greatest technique for expanding state/corporate power simultaneously gets eroded as an individual right? Not only with public photography and the simultaneous rise of perpetual surveillance, but think how flying model aircraft has, in recent years, become synonymous with pseudo-terrorist "drones" in the hands of private citizens; meanwhile state-sponsored warfare can be conducted remotely using the same technology. Or think about a "free press," which more and more has become the right only of some corporate elite media; try getting into a "media event" without an official "press pass." Maybe it's always been this way; but the dichotomy nowadays is striking, to those of us paying some attention. And, in case you were wondering, I'm a very cautious and timid street photographer, hence why many of my images are devoid of the public persona; and why I had printed a self-published photo book called "Implied Presence," street photography minus the people. I probably wouldn't be the guy photographing private spaces from the public right-of-way, either. Photos via Lumix G5. Typecast via Olivetti Lettera 22. Bonus Image: One of the few I've made with the overt human presence. It was easy for me, being as how the subject was asleep. Post-Script: Below is a photo of the Mead paper's front label, for those curious. And here's the link to the product on Amazon. Note the difference in packaging (particularly the label) between what was advertised and what I received. If you find this paper less expensive somewhere else (keeping in mind shipping), please let us know. Post-Script: The only two types of straps discussed that I have any personal experience with are the Gordy wrist strap, and the Sailor Strap, both of which I have owned, used and enjoyed. 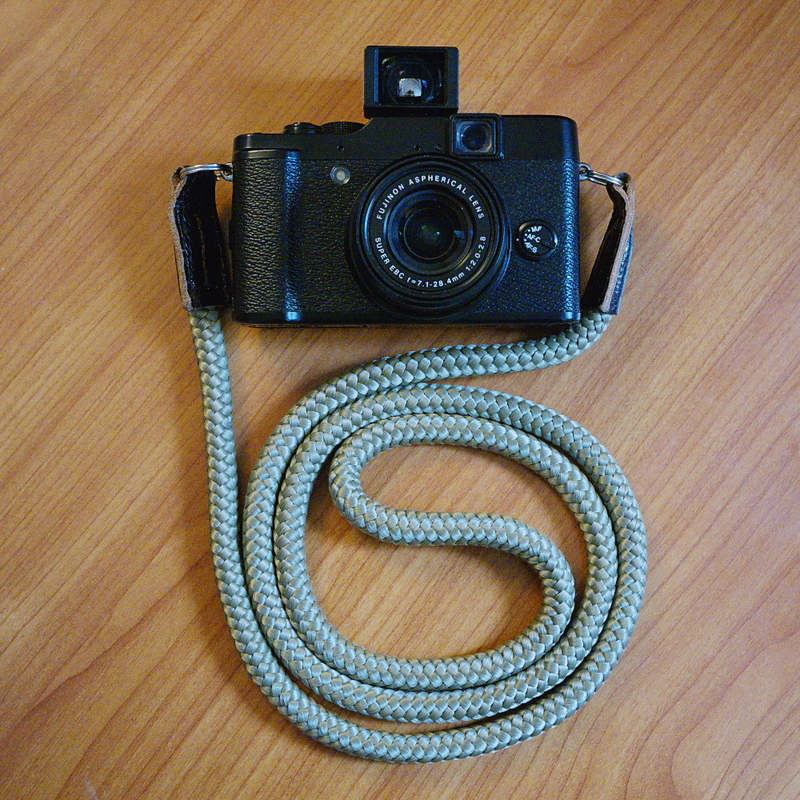 The top photo shows the Fujifilm X10 sporting the longer Sailor Strap, which permits it to be worn bandolier-style. Typecast via the Brother/Webster XL-747. 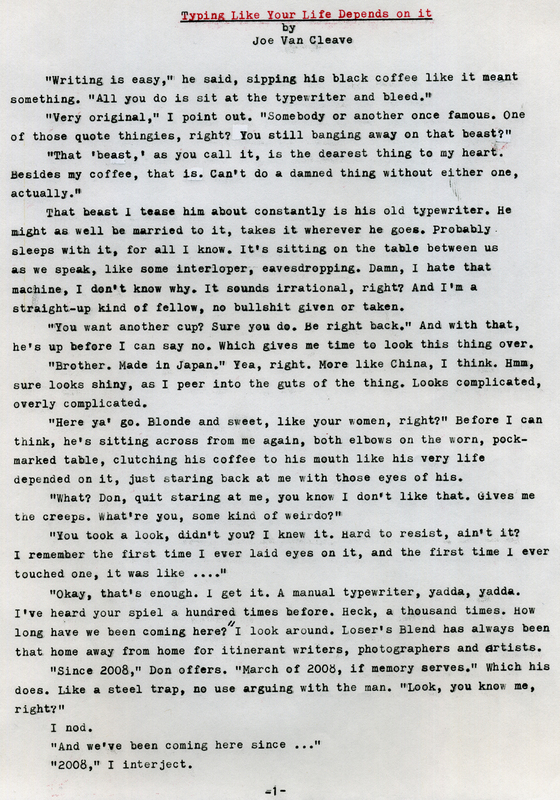 Post-Script: Here's one example of my friend's work, a poem titled "The Sugar Woods," scanned from his typewritten, hand-bound book "The High Place". The top portrait was a scan from his book, that itself was a photocopy of an original, hence the poor quality. I do hope to get more of his work scanned and posted here, in an ongoing series. Post-Script: Inspired by a session of Man Cave typing with the little Brother/Webster XL-747. Yes, perhaps a bit over-the-top and too political. I've tried to stay out of the realm of politics and controversy on this blog, if for no other reason than not wanting to alienate my readership, knowing that many of you come from diverse backgrounds. So, if this has offended, bothered or merely bored you, I promise to not always post these kinds of rants. I just need to order more of that delicious Pumpkin Spice Democracy and go chill. Photo via Lumix G5, typecast via Brother/Webster XL-747. Do you suppose the model number was some not-so-well-disguised attempt to gain some marketing advantage by using the same model number as the then-new Boeing 747? If so, that would be amusing, given that the airplane was the largest of its kind, and the Brother one of the smallest. Even the "XL" part of the model number would be amusing, in this context. "Typing Like Your Life Depends on It"
What follows is a little bit of what might be called Typewriter Insurgency Fiction, a piece I drew up from inspiration following a recent extended typing session with my Brother/Webster XL-747. The setting and one of the characters is borrowed from my previous "Bill" series, which some long-time readers of this blog might remember. 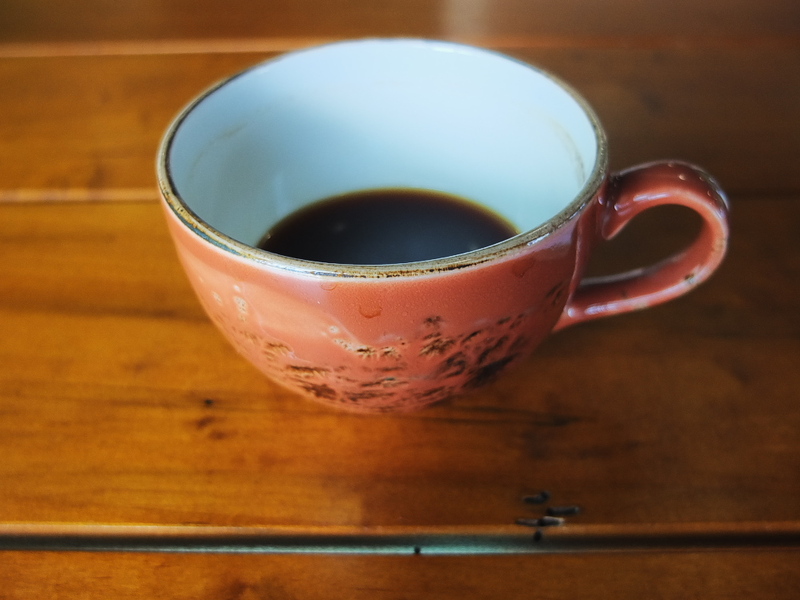 The setting of this piece, Loser's Blend, is loosely based on my favorite Albuquerque coffee shop, Winning Coffee. I also have a dystopian cyberpunk novel in the works (meaning several years of no progress) that uses this same Loser's Blend coffee shop, in a slightly futuristic setting. 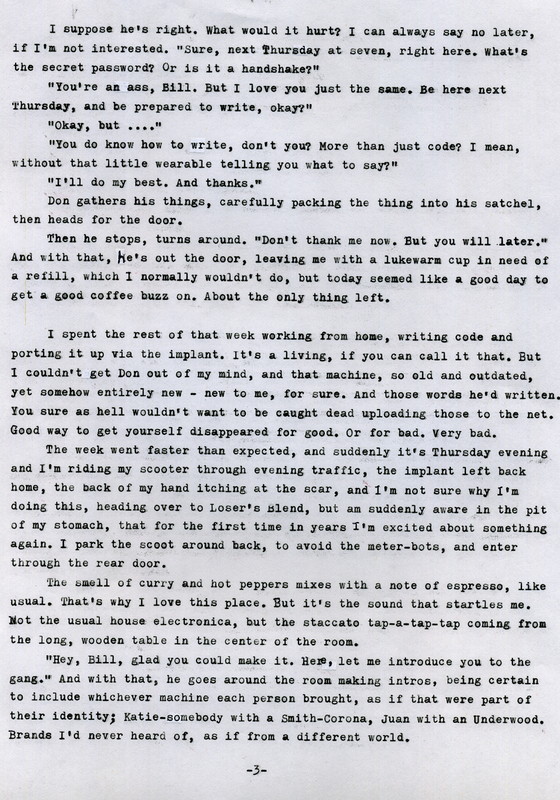 Post-Script: I think writing fiction on portable typewriters is a real hoot, something I need to do more of. 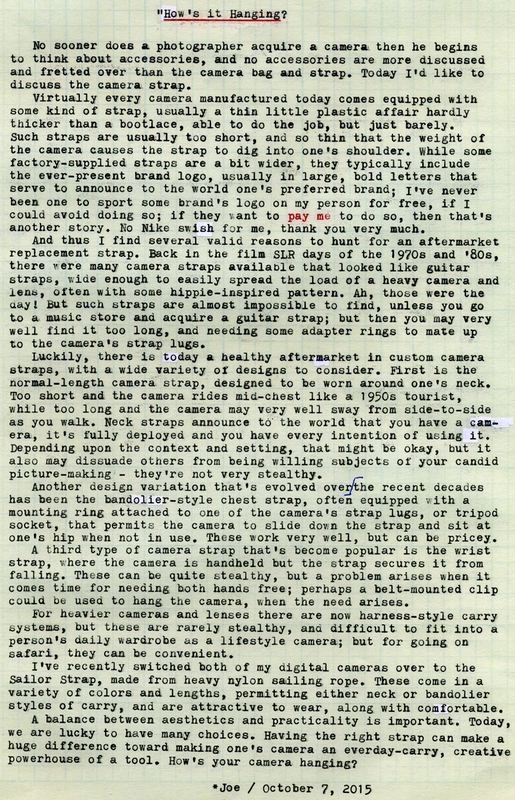 As you might know, I've tried to keep my scanned images of typecasts as organic as possible, including paper texture, ink smears and any corrections left obvious, in an effort to make the online result as close to the realism of holding a typewritten sheet in-hand.